If you have a projector or second monitor connected to your computer, PowerPoint 2016 will show the presentation’s slides on the projector or second monitor and switch the primary monitor to Presenter View. The figure shows Presenter View in action. Current slide: The current slide is displayed in the center-left portion of the screen. Next slide: The next slide to be displayed is shown at the top right of the screen. Notes: Any notes you have created for the current slide are shown at the bottom right of the screen. Timer: A timer appears above the current slide to help you keep track of how long your presentation has dragged on. Tools: Beneath the current slide are icons representing various tools that let you draw on your slides, magnify the slide to draw the audience’s attention to a particular point, hide the current slide so you can draw the audience’s attention away from the screen and to you, and perform a few other interesting onscreen tricks. 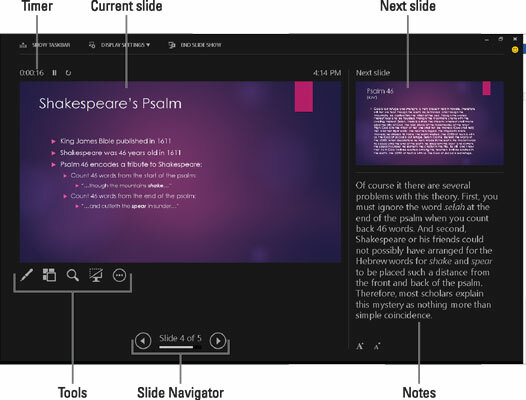 Slide Navigator: These controls let you advance forward or backward through your slide show.